Very often an aquarist's first impression of their first catfish is entirely missed. Once released from the plastic bag that it was brought home in, the fishes first act is to dive for the darkest, most inaccessible area of the aquarium. South America's bumblebee catfish certainly fits this description but it also continues this game of hide and seek throughout its captive life. Put half a dozen of these fish in a well decorated aquarium and you will not see them for months. Personally I find this quite rewarding as it makes a "sighting" more of an event. In addition, because you only see the fish from time to time, you markedly notice how much it has grown, coloured-up or filled-out in a way that you wouldn't if you saw the fish all the time. Although this fish can be seen during the day from time time time but it is usually travelling at high speed towards either food or cover. One of the more endearing traits of these fish is that they are quite as at home in dense vegetation as they are under a piece of rock or driftwood. Given such plant growth the fish will make darting runs from this refuge to wherever there is food and back again. Their care is straightforward. The fish are not fussy eaters and will tend to pick off small pieces of food others leave behind. This form of feeding shouldn't be relied on (especially if there are other nocturnal feeders present) and feeding the tank a couple of hours after "lights out" ensures food for all. 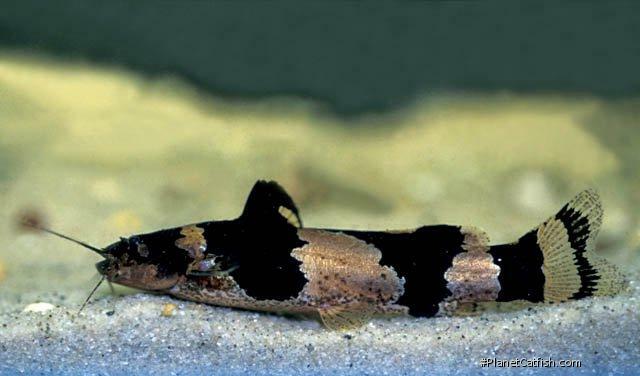 The South American bumblebee catfish is so called because of its yellowish and black banding but to call it simply the bumblebee catfish would be misleading as the larger Asian Bagrid Pseudomystus siamensis is commonly referred to as THE bumblebee catfish. As a quirk of how the export markets change over the years you are now much more likely to encounter the South American for sale. A word of warning, although all catfish of the genus Microglanis are relatively small and good community fish, they are very similar to young giant bumblebee catfish (Pseudopimelodus spp. and the like). These fish grow quite large but will attempt to eat anything they can in the process. They are ambush predators and their appetite is legendary. The best way to tell these fish apart is to look at the mouths; the giants have huge mouths which takes up virtually their entire head, whereas Microglanis have quite a large mouth but with a much smaller gape. Microglanis also have larger eyes. Collecting location: Venezuela, Estado Miranda, Rio Merecure, Rio Tuy Drainage. Collected from the Rio Merecure near the bridge that crosses the river on the road between Caucaqua and Higuerote. Water was very clear and flowed at a moderate to strong pace. Substrate was exposed bedrock and fist-sized stones. No aquatic vegetation present. Microglanis were collected in the riffles and along the banks among the root systems and overhanging terrestrial vegetation. Water chemistry: pH 7.2, 60 ppm GH, 76-80F (warmer in the shallows). Also collected were: one species of pike cichlid, Acara sp. (Blue Acara), Hypostomus sp. fry, various tetras (mainly Astynax bimaculatus), Hoplias tetras, and Characidium darter-tetras. Type Locality Río Turmero, Aragua, Venezuela. Feeding Omnivorous. This fish is not a fussy eater. Brineshrimp appears to be a special favourite. Furniture Dense leafy vegetation such as provided by large clumps of Java fern or Amazon swords. Narrow cracks or holes in between rocks or wood are also used. Compatibility Non aggressive and sociable with its own and other species. Suggested Tankmates Virtually all good community fish, although any young fry present in the aquarium will be in extreme jeopardy - especially after dark.